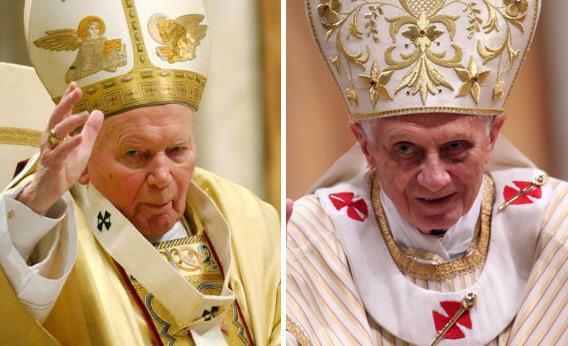 John Paul II vs. Benedict XVI: Popes, abdication, and Catholic hypocrisy. Catholics who eulogized Pope John Paul II for serving to the bitter end now praise Pope Benedict for quitting. Make up your minds. Eight years ago, when Pope John Paul II passed away, the United States Conference of Catholic Bishops praised him for staying on the job to the bitter end. “The elderly and infirm have been inspired by his indefatigable perseverance as his own physical limitations mounted,” said the bishops’ president. Today, the bishops are praising John Paul’s successor, Pope Benedict XVI, for quitting. “His resignation is but another sign of his great care for the Church,” said the bishops’ new president. His last years were full of pain and suffering. Yet he never tried to hide his deteriorating physical capacities; he seemed unembarrassed by frailty; and by continuing his papal service until the very end, he fulfilled the pledge he believed he had made to the Church, and to the Church’s Lord, at his election on October 16, 1978—the pledge to spend out his life in strengthening his Christian brothers and sisters in their faith. Benedict is old, 86, and for 24 years, as John Paul’s Prefect of the Sacred Congregation for the Doctrine of the Faith, he was one of the few to see, up close and day by day, the price the Vatican as an institution paid for the otherworldly courage of John Paul, whose last few years were one long goodbye, and whose ability to administrate was diminished as he became physically disabled. …And he is older than John Paul was when he died at 84. Perhaps in Benedict’s decision we are seeing not a witness to suffering but an act of self-sacrifice and humility that in its own way too is other-worldly. It’s obvious what’s going on here. These are people of faith. They’ve put their faith in a church and the men who lead it. They’re determined to find virtue and wisdom in these men, even when two consecutive popes choose completely different courses. While we all witnessed an enfeebled holy man suffer great infirmity in love and patience, Cardinal Ratzinger must have seen much more. He must have seen how during those years of decline the Vatican bureaucracy becomes de facto pope and how that de facto Pope can thwart and subvert the will of the legitimate Pope. This is a debate well worth having. On one side, those who think, on reflection, that Benedict was right to step down and that John Paul, for the same reasons, was wrong to hang on. On the other side, those who believe that John Paul was right and that Benedict, for the same reasons, is wrong to quit. A clash between these two schools won’t be as tidy as a chorus of gymnastic apologists bent on defending both popes. But it will be more fruitful and more honest.